MISSION VALLEY - The Chargers' departure to Los Angeles is making for an uncertain future for Qualcomm Stadium in San Diego. And, now, plans initially conceived to upgrade the aging site are in limbo. 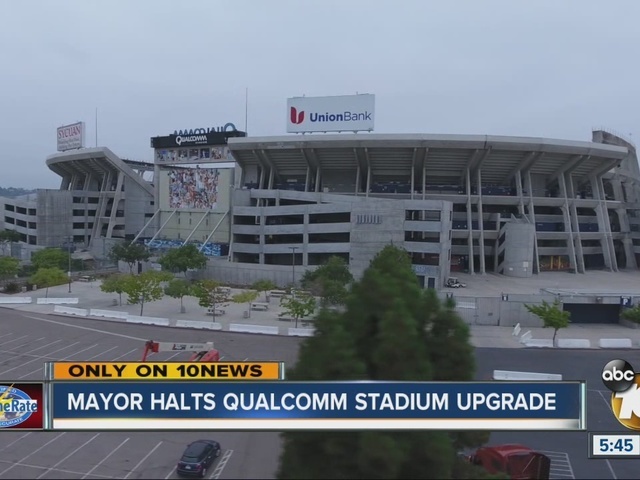 Upgrades scheduled for the stadium's high-definition video programming output to the tune of $576,000 have been placed on hold, Mayor Kevin Faulconer told 10News Wednesday. The upgrades would have installed new fiber optic cables and conduits, which would allow for Wi-Fi installation in the future. The project was projected to begin in a couple of months and be completed by the end of the year. "You always have to evaluate what’s the right way to move forward," Faulconer told 10News reporter Jon Horn , when he brought the plans to the mayor. "Ever since last week you have to look at everything in terms of how you move forward, what’s the right thing to do, not just short term, but for the long term." Less than 30 minutes later, Faulconer said he decided to shelve the plans now that the stadium is without a tenant. "It’s important that we’re making the right financial decisions, and I got the information. I’m going to put this on hold," Faulconer said. "That’s not a good use of dollars to move forward with, particularly as we’re planning the future of Qualcomm and the entire site. "It’s the right thing to do from a financial standpoint, and it’s just common sense." In addition to the money being saved on the upgrades to The Q, the Chargers must pay the city a nearly $12.6 million termination penalty in 2017. That money will be placed in the city's general fund as unrestricted revenue. The mayor and city council will determine its use during its next budget process. In July 2016, a city spokesperson said about $415,000 had already been allocated for the stadium technology improvements. At the time, the project was considered a go despite the team's uncertain future. "The future of the facility is up in the air depending on so many different variables. Until a decision is made we’re going to continue to do what we can to maintain it," the city spokesperson said, adding that the venue attracts a variety of events beyond football. The upgrades were not guaranteed to enhance the game day experience for fans. The upgrades were meant for teams and media, with Wi-Fi hot spots that fans may be able to tap into.